Archispeak celebrates its 6-month anniversary! We reflect on the past 12 episodes and acknowledge Apple’s 1-billionth podcast subscription milestone. We then discuss why “good enough is the enemy of great” and explore why architects might design compromises into the project before it goes out of the studio/building. We also consider what you can do to not miss out on design opportunities during all aspects of a project, including within the office and engaging the local building officials. ✱ Are you listening to podcasts yet? - Evan takes a look at podcasting and Apple’s 1 billion podcast subscriptions through iTunes. Let’s Make Mistakes (podcast) - Mike and Jessie talk about design, with a lot of tangents along the way. 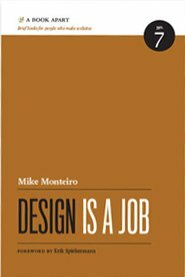 Design is a Job - Co-founder of Mule Design and raconteur Mike Monteiro wants to help you do your job better, so he wrote a book. You can buy it on Amazon and support the show by clicking the book cover image here. It doesn't cost you anything extra, but it will help us out. To become a “Friend of the Show” donate at least $5 and get your name read by a host on the next episode. We truly thank you for your support guys! We couldn't do it without you. Would you consider supporting us? It's easy. Just click the button!